Douglas N.C. Lin, professor of astronomy and astrophysics at UC Santa Cruz, was a friend and colleague of Stephen Hawking, the renowned physicist who died on March 14 at age 76. 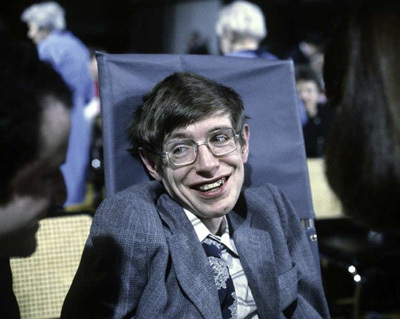 Lin first met Hawking in the 1970s as a graduate student in the Institute of Astronomy at the University of Cambridge, where Hawking was then a researcher and later held one of the most distinguished posts in the university, the Lucasian Professorship of Mathematics. After Hawking's death, Lin felt moved to write down some personal reflections on the man he knew and admired. The following essay was written for publication on an academic website in China, and Lin has given us permission to reprint it here. Like many friends and colleagues, I am deeply saddened by the passing of Stephen Hawking. He was not only one of our most brilliant minds, but also perhaps the most inspiring role model for humanity today. I feel extremely privileged to have gotten to know him from up close over the past 45 years. His winning smile, witty remarks, and determined spirit are deeply rooted in the recollections of all those around him. My first glimpses of Stephen date back to 1972, when I joined the Institute of Astronomy in Cambridge, U.K., as one of the four incoming graduate students. I got to know him as a good friend and close collaborator of my Ph.D. advisor Brandon Carter. That summer, they had just constructed with Jim Bardeen in Les Houches an elegant theoretical framework known as “black hole thermodynamics.” Papers and notes covered every corner of the desks and floor of their shared office. Yet Stephen always knew precisely where to retrieve the document he needed. His speech was slurred and hard to understand at first. He had to use a wheelchair to move up and down the corridor, and he was determined to use his own hands to propel it. Despite his rapidly deteriorating condition, he worked intensely in his office often past 7 p.m. each evening. As I helped to transfer him into his hand-controlled electric car, I was always a bit terrified and worried that it would not have sufficient power to avoid fast-moving trucks along the path of his homeward journey. The Institute of Astronomy was a wonderful place where the students were not only inspired by daily interactions with its prominent faculty and international renowned visitors, but also embraced as family members and intellectual partners. I was often a guest for lunches or dinners at my advisor's small cottage in a village nearby, and that’s where I first met Stephen's wife, Jane. These meals were very casual and revolved around highly intellectual conversations, ranging from science to culture to history. Often, casserole on the stove would be burnt as Chef Brandon became so engaged in the conversation that he forgot what was cooking. After Brandon and his wife Lucette moved to their new appointments in Paris, I was invited to dinner several times at Hawking's home in a very small flat in Little St. Mary Lane. Its four floors of confined space were vertically threaded through by a narrow stairway. On one occasion when Kip Thorne came to dinner, Stephen climbed up the stairway to retrieve something he wanted to show Kip. Jane stopped me when I offered to help. She indicated that Stephen would like to do everything by himself and the exercise was good for him. It was clearly evident that with Jane's steadfast devotion and tender loving care, Stephen was determined to live as normal a life as he possibly could. On sunny days, Jane often took their toddlers to visit Stephen at the Institute of Astronomy, where a small area of the director's garden was carved out to be the Hawkings’ vegetable plot. On one clear summer evening after their visit, I volunteered to help Stephen view Saturn through the Northumberland Telescope, where James Challis failed to discover Neptune a century earlier. Being a theorist I was not particularly good at lining up the telescope pointing. Since Saturn was not much above the horizon, I had to put Stephen in a wooden chair to move up a laddered track. It was actually the first time he saw with his own eyes the spectacular rings of Saturn. He told me that Galileo was among the first to see Saturn's rings, and then proudly announced that he, Stephen Hawking, was born on the 300th anniversary of Galileo's passing. It is also notable that Hawking passed away on the 139th anniversary of Albert Einstein's birthday. Much of the social life in Cambridge revolves around the colleges. I was in the same college, Gonville and Caius, as Stephen. The master of the college was Joseph Needham, whose monumental contribution on the history of science and civilization of China was often the focal point of conversation over formal dinners around the high table. Stephen regularly participated in these social gatherings, where scholars of different disciplines inspired each other. In order for him to get up to the second-floor dining hall, Stephen had to delicately maneuver his wheelchair through the food delivery elevator in the college kitchen. Physical disability and speech impediment did not diminish his active engagement in these uniquely intellectual social events. It was also during this period that Hawking made the discovery of black hole radiation. His initial motivation was to examine the validity of Bekenstein's literal interpretation of entropy. Along the way, he came to the truly innovative revelation that quantum effects could cause black holes to radiate. He spent long hours in the office in deep thought while staring into the open pasture just outside his window. Since his hand movement was somewhat impaired, he did most of the calculations in his head. His students helped him to write down his thoughts on paper. When he made the announcement of his new discovery, he was not deterred by some initial skepticism from one or two authoritative figures in the field and the few glitches in the publication process. He continued to shore up the conceptual basis of this remarkable theory. His work on singularity theorem and black hole radiation attracted intense interest from the academic community. There were countless invitations from all around the world for him to visit and to lecture. He made every effort to travel widely and interact broadly, exerting enormous effort not only in the travel logistics but also in managing his everyday life. On the occasion of mathematician Shiing-Shen Chern's visit, Stephen and Jane came to our home for dinner. We were terrified when he choked on a piece of chicken. Jane calmly put her arm around Stephen and applied a bit of pressure to clear the blockage. She then told me that she had 1/8th Chinese blood and her maternal great grandmother's family name was Lam. When I explained to her that Lam was the Cantonese pronunciation of Lin, she proclaimed that we were long lost distant cousins. A year later, they adopted our first born, who was named after her, as their goddaughter. As Stephen's ALS advanced, a team of nurses and some students moved into their new home next to Gonville and Caius's Harvey Court. Despite their all-out effort to maintain a normal domestic setting, the physical stress and emotional strain started to take a toll. Jane took some relief in completing her Ph.D. in modern language, singing and yoga. They took time out for annual family vacations in their cottage off the Brittany coast in France. While Jane was the commander-in-chief of these operations, Stephen cherished the family life despite the enormous challenges he had to endure and overcome. By the late 1970s, Stephen's ALS had advanced to the stage that he had to use a motorized wheelchair. This gadget became the favorite toy go-cart for his own and other visiting young children. His smiles reflected his amusement and pleasure on these occasions. Stephen Hawking’s inspiration and persona made him an instant superstar. He enjoyed his role as a public figure and the limelight everywhere he went. While most people would complain about inconvenience and avoid long-haul flights, Stephen was actually invigorated by adventures into exotic places, from the Great Wall to the White House. He was eager and enthusiastic to experience a weightless flight in a NASA training plane. Unfortunately, during one trip to Switzerland he came down with life-threatening pneumonia. Jane decisively ordered an emergency airlift to bring Stephen back to the U.K. The tracheotomy operation, though it saved his life, completely disabled his vocal cords. When I visited him in the Addenbrook's Hospital in Cambridge a few weeks later, he appeared to be very depressed and seemed to have lost the will to live. Jane was at his bedside and tried to help him to develop a new way of communicating through eye movement over the alphabet board mounted on a transparent frame. Fortunately, the rapid advancement of technology soon enabled him to acquire a voice synthesizer that he could control with his thumb. Although this device greatly slowed down the pace of his dialogues, the reopening of this channel of communication completely revitalized him. His only initial complaint was that it gave him an American accent! Subsequently, he refused to replace this synthesizer as it became his signature voice. After I moved to California, I visited Stephen when I came to Cambridge for conferences on numerous occasions. Despite his deteriorating health, he was intensely interested in many fundamental issues in both science and humanities. A few years ago, we talked about life elsewhere in the universe and the prospect of artificial intelligence. By then his means of communication had resorted to eye movements over a miniature screen on his glasses. Each concise sentence took about ten minutes or longer to compose. But that barrier did not deter him from making every effort to express his opinion. It is remarkable that Stephen survived ten times longer than what doctors had predicted when he was first diagnosed with ALS. It is a miracle that he overcame the countless challenges and obstacles to make such a huge impact in science and humanity. He became a legendary role model for the general public and the ultimate icon of mind over matter. We often joked about his classic book, A Brief History of Time, as being the most unread best-seller. Yet he was a warm individual and family man with a great sense of humor and passion. Whenever I am faced with problems or upset by disappointments, my thoughts turn to his boundless determination, optimism, and courage. On his continued journey through the universe, he will always be in my mind.